Hollywood comedian Jerry Lewis, who died Sunday aged 91, perfected a goofy brand of slapstick that endeared him to millions over the course of a career spanning six decades. The comedy legend, who at the peak of his popularity was among the world's biggest movie draws, died at his home in Las Vegas early Sunday morning. "I can sadly confirm that today the world lost one of the most significant human beings," said his publicist Nancy Kane. "Jerry died peacefully at home of natural causes surrounded by family and friends." Fans left flowers at the comedian's two stars on the Hollywood Walk of Fame. Over the course of 45 years, he raised some $2.45 billion for combatting the disease with an annual television event. Born Joseph Levitch in Newark, New Jersey to two entertainers, Lewis first took center stage at the tender age of five, when he performed "Brother, Can You Spare a Dime?" He began playing at resorts outside New York that catered to Jewish patrons, known by touring entertainers as the Borscht Circuit. Tributes poured in Sunday from Hollywood royalty. "Jerry Lewis was a master. He was a great entertainer. He was a great artist. And he was a remarkable man," said Martin Scorsese, who directed Lewis in 1983 film "The King of Comedy." "That fool was no dummy," tweeted comic star Jim Carrey, who cited Lewis as an inspiration. 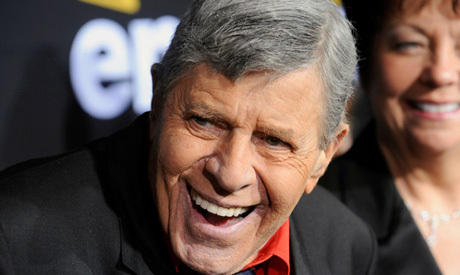 "Jerry Lewis was an undeniable genius an unfathomable blessing, comedy's absolute! I am because he was!" The White House called Lewis "one of our greatest entertainers and humanitarians." "Jerry Lewis kept us all laughing for over half a century, and his incredible charity work touched the lives of millions. Jerry lived the American Dream -- he truly loved his country, and his country loved him back," press secretary Sarah Huckabee Sanders said in a statement. Some of the most notable films in Lewis' extensive repertoire include "It's a Mad, Mad, Mad, Mad World" (1959), "The Geisha Boy" (1958) and "Funnybones" (1984). His box office grosses, spanning nearly 50 years, total $800 million -- an impressive figure since movie tickets cost no more than 50 cents during the height of his popularity. After 17 films together, the Lewis-Martin partnership split in 1956, but Lewis continued his career in comedy and Hollywood. He won acclaim for his dramatic role alongside Robert De Niro in Scorsese's "The King of Comedy." "Be a hit. Score," was his simple advice to young comedians, in comments once made to Larry King, the celebrity interviewer and a longtime friend. "Get the audience laughing and happy. That's the secret." "Funny is fragile. It's elusive," he told the Los Angeles Times in 2010. "It's elusive to everyone because you're never going to get a handle on what's funny." Fellow comedian Carol Burnett -- who worked with Lewis several times -- marveled at his physical gifts. "His voice could go up several octaves when he was supposed to be scared or insecure," she told CNN. "Our audience was just dying with laughter, because he did such wonderful things with his body." Lewis' long career was not without controversy, however. News reports over the years have criticized him as volatile and ill-tempered and he was accused more than once of berating fans attending his shows. In 2007, during the 18th hour of his telethon, the then-81-year-old actor used a homophobic slur in introducing a person off stage -- later apologizing for "a bad choice of words." "I have to finish what I've started," he told the Los Angeles Times in 2010. "I want to do it before I leave."